A collaborative team of scientists from IBM, Princeton University, and the Icahn School of Medicine at Mount Sinai have developed novel lab-on-a-chip technology that can, for the first time, separate biological particles at the nanoscale and possibly enable physicians to detect diseases such as cancer before symptoms appear. The new report—“Nanoscale lateral displacement arrays for the separation of exosomes and colloids down to 20 nm”—published today in Nature Nanotechnology, shows size-based separation of bioparticles down to the low nanometer (nm) scale, which allows investigators access to important particles such as DNA, viruses, and exosomes. After separation, bioparticles can be analyzed by researchers looking to uncover signs of disease even before patients experience any physical symptoms and when the outcome from treatment is most positive. Until now, the smallest bioparticle that could be separated by size with on-chip technologies was about 50 times larger, for example, separation of circulating tumor cells from other biological components. The research team was particular interested in isolating exosomes, as they are increasingly becoming viewed as valuable biomarkers for the diagnosis and prognosis of malignant tumors. Exosomes are typically released in easily accessible bodily fluids such as saliva, urine, or blood and represent a precious biomedical tool that can be used as less invasive liquid biopsies, to reveal the origin and nature of cancer. The research team's results showed that they could separate and detect particles as small as 20 nm from smaller particles, that exosomes of size 100 nm and larger could be separated from smaller exosomes, and that separation can take place in spite of diffusion, a hallmark of particle dynamics at these small scales. Along with Mount Sinai, IBM plans to confirm their technology can pick up exosomes with cancer-specific biomarkers from patient liquid biopsies. Mt. 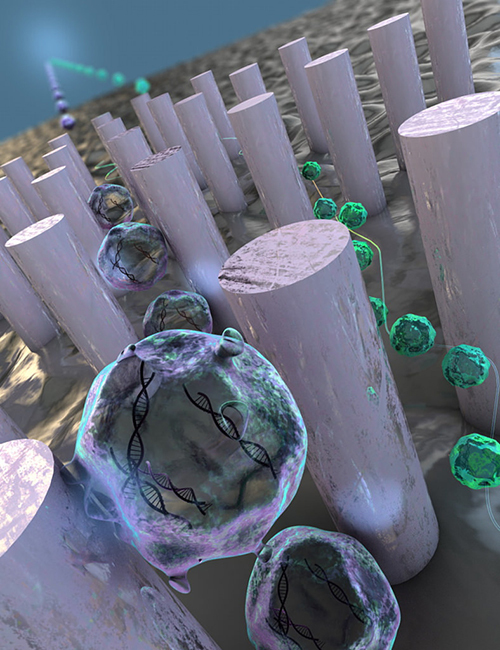 Sinai researchers hope that with the ability to sort bioparticles at the nanoscale that this new technology will provide novel methods intercept the messages carried by exosomes for cell-to-cell communications. This can elucidate important questions about the biology of diseases as well as pave the way to noninvasive and eventually affordable point-of-care diagnostic tools.